Keep your fingers warm no matter what mother nature brings. These Extreme Winter Gloves are the warmest out there. They are made with a totally waterproof stretch nylon spandura® outer shell that is bonded to a waterproof inner membrane with 3M Thinsulate® insulation and a polar fleece liner. 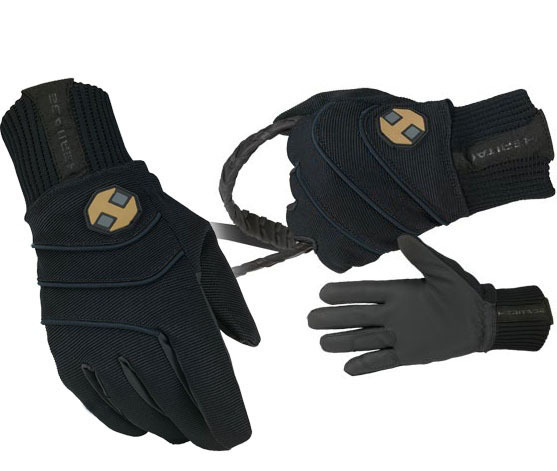 They provide a comfortable fit when riding and working and are one of the warmest riding gloves available. Warm comfortable fit that locks out wind and cold with knit cuff. Four layers of protection for your hands. Inseamed construction leaves no seams exposed to the elements. Long knit cuff with elastic band locks in warmth. 4-4 1/2" Small - 3"
5-5 1/2" Medium - 4"
6-6 1/2" Large - 5"
6 1/2-7" Small - 6"
7-7 1/2" Medium - 7"
7 1/2-8 1/2" Large - 8"
8 1/2-9 1/2" Medium- 9"
9 1/2-10 1/2" Large - 10"
10 1/2- 11 1/2" Extra Large - 11"